There might be a new face on the $20 bill, if Sen. Jeanne Shaheen, D-New Hampshire, has her way. The New Hampshire Democrat introduced the Women on the Twenty Act in the Senate Tuesday, legislation that would require the Treasury to "convene a panel of private citizens" to recommend a woman to be printed on the $20 Federal Reserve notes, according to the text of the bill. "Our paper currency is an important part of our everyday lives and reflects our values, traditions and history as Americans," Shaheen said in a statement. "It's long overdue for that reflection to include the contributions of women." 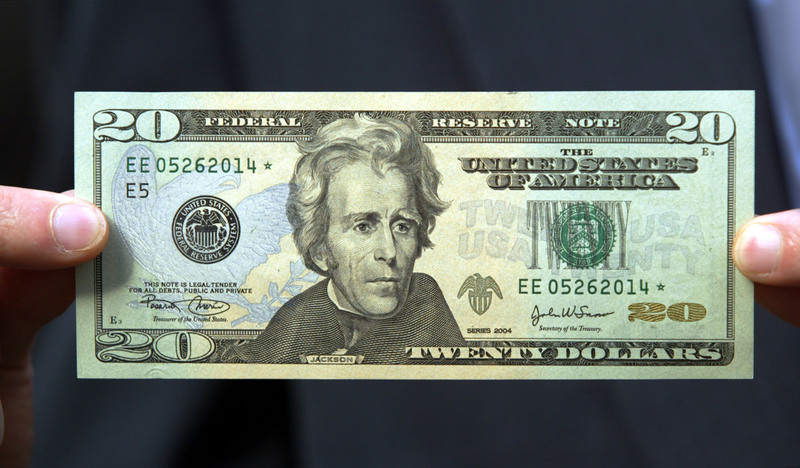 Which woman should grace the $20 bill? The panel would then advise the Treasury Secretary on a redesign of the bill, considering and weighing popular input. The New Hampshire senator also tipped her hat to a non-profit grassroots campaign that has made it their mission to change the face on the paper currency. The campaign, called Women On 20s, aims to change the twenty dollar bill by 2020, marking the centennial anniversary of the 19th amendment, which gave women the right to vote. The group has tried to identify the best candidate to replace Andrew Jackson, the current face of the $20 bill. They claim that more than 480,000 votes have been cast over two ballot rounds, whittling down a field of 15 historic women to four: Eleanor Roosevelt, Harriet Tubman, Rosa Parks, and Cherokee Nation Chief Wilma Mankiller. "The incredible grassroots support for this idea shows that there's strong support for a woman to be the new face of the twenty dollar bill," Shaheen said. And President Obama himself has weighed in on the proposal, calling it a "pretty good idea." While the Women on 20s campaign did not work with Shaheen's office, they were heartened to hear of the Congressional push. "Having this support from members of congress -- it's very important to us," Susan Ades Stone, the organization's executive director, told CBS News. "It just reinforces that there's real sentiment out there for this." Women On 20s plans to take the final results of their votes to push through a White House petition regardless of Shaheen's bill, and changing the paper currency does not require congressional approval. The portraits on the seven main bills were initially chosen in the 1920s by a Treasury-appointed panel of citizens. Other efforts to change paper currency, however, have largely failed -- from Grover Norquist's 2004 attempt to replace Alexander Hamilton on the $10 bill with Ronald Reagan, to Rep. Patrick McHenry's 2010 legislation to put the conservative superstar on the $50. The Women on Twenty Act was referred to the Senate Committee on Banking, Housing, and Urban Affairs shortly after its introduction.